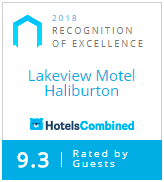 All of our rooms are equipped with 4-piece bathrooms, cable TV, bar fridges, microwaves, coffee stations, wireless Internet, alarm clocks, air conditioning, electric heating, and telephones (free local calls). Cots are available upon request. BBQs are available for no charge. All of our rooms have been smoke-free for years, with no trace left behind. All rooms except the Loft are stair-free. The Loft and Family Room units are perfect for families, groups, and long stays. The Loft has a full kitchen. The prices below are active until May 16, 2019. Please visit our online booking system for other dates. Six motel rooms on the upper level open to the parking lot at the back and a balcony with a great view at the front. These rooms are mere seconds from the pool and trails. Six lower level rooms open to the front of the property with patio space, and optional hot tubs outside some rooms. BBQs and horseshoe pits are right outside your door, and you have easy access to the lawn for kids & pets. Avoid the cost of eating out every meal on your vacation or business trip by making use of the full kitchen in this efficiency unit that easily accommodates up to eight people with two queen-sized beds, a pull-out couch, and a futon. Dishes and other supplies are provided. This room is allergy friendly and accessible by stairs only. Perfect for a family or longer stays, this spacious, comfortable room sleeps four (on a king-sized bed and two twins), with extra room for a cot. It can also be converted into common/event space for large group bookings. The room features a private patio and optional outdoor hot tub, a dining table and large dresser. We require five days notice for cancellations, or two days during the off-season. There is a $20 cancellation fee after the deadline. If you do not provide notice of cancellation, you will be charged for the equivalent of one night’s stay. All rates are for one night’s stay. Quotes are available for groups and long-term plans, including meal plans. We accept Visa, Mastercard, American Express, Interac, and cash.